Yunus Emre Institute is organizing the "Applied Cultural Diplomacy Training Program" with a view to sharing its academic knowledge and practical experience in the field of cultural diplomacy and improving Turkey's cultural diplomacy potential. Prof. Dr. İlber Ortaylı, Alev Alatlı, retired ambassador Prof. Dr. Kenan Gürsoy, Paulino Toledo, Leyla İpekçi, Ömer Tuğrul İnançer, Ayşe Böhürler and other experts who act as standard bears of the Turkey's cultural diplomacy practices will be lecturing at the program which offers great opportunities for those who intend to work at the United Nations, the European Union, NATO, Yunus Emre Institute and many other national and international organizations and civil society organizations. The program will help participants study Turkey's cultural diplomacy practices as well as the effects of its intellectual background on cultural diplomacy, and the workshop to be held as part of the program will give participants a chance to turn what they learn into practices and projects. Anyone who wants to learn about cultural diplomacy applications in national and international settings, to conduct academic or professional work in this field and to contribute to Turkey's cultural diplomacy potential may apply for the program. The program will also feature seminars, interviews, panel discussions, workshops and other training-oriented events and the deadline for application is February 15. The program will start in Istanbul on March and be held on weekends for three weeks. 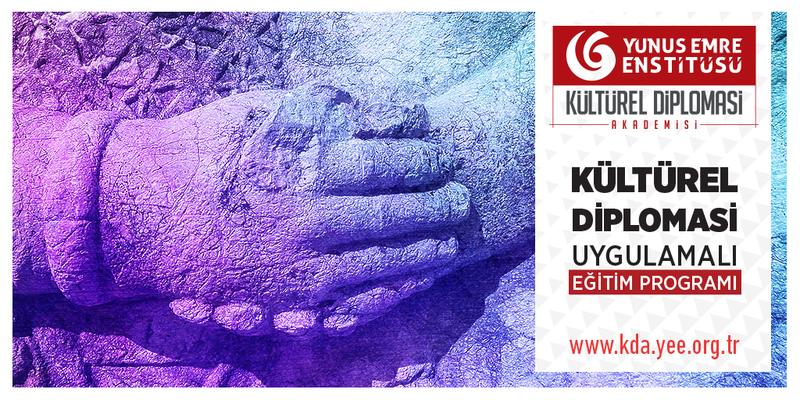 To obtain detailed information about, and apply for, the program with limited seats, please visit kda.yee.org.tr.